If I worked at a job that required me to dress professionally and modestly, this is what I imagine I would wear. 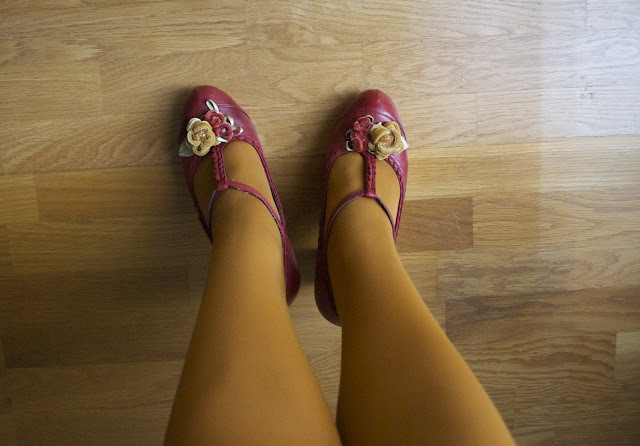 It doesn't show off skin or curves, but I still get to wear fun shoes and bright tights. It was fun to dress a bit fancier than my usual casual A-line dress and boots or flats. Fancy Friday is the new Casual Friday! What do you think? Do you work at a 'business casual' job? Could you get away with an outfit like this at the office? Thanks for posting this info.Lace Wedding dress I just want to let you know that I just check out your site and I find it very interesting and informative. I can't wait to read lots of your posts.